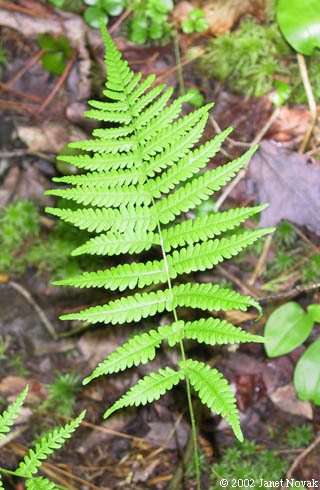 Thelypteris simulata is a fern from a creeping rhizome. Leaves arising in small clusters from rhizome tips, to 50 cm long, 15 cm wide; stalk to 35 cm, base pale brown, slightly scaly, yellow-green above; blade once pinnate-pinnately lobed, leaflets tapered at both ends, lobed almost to midrib, lobes blunt-tipped. Spore cases along veins, kidney-shaped (Cobb 1963). 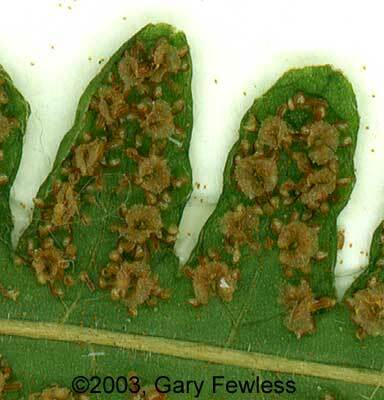 Thelypteris simulata.spore cases (sori).© 2003 Gary Fewless.University of Wisconsin – Green Bay.Cofrin Center for Biology.uwgb.edu (Accessed 3/2017). Habitat: Acid bogs and swamp forests. Apparently shade tolerant. Notes: Similar to T. palustris but blade of T. palustris is described as narrower, and spore cases differ.